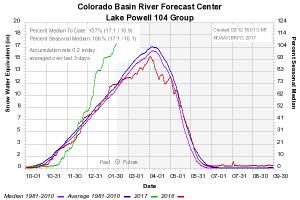 While we were all distracted by the chaos at Oroville Dam, the snowpack above Lake Powell on the Colorado River last week climbed above normal for the year. By this measure from the CBRFC, it’s at 57 percent above average for mid-February. It doesn’t usually peak until early April. Based on the latest round of forecasts, expect it to keep rising. This is good news for levels in Lake Powell and Lake Mead, the two large reservoirs that provide storage for basin water users. The current model estimate for April – July flow into Lake Powell is a staggering 3.5 million acre feet above the Jan. 1 forecast. To get a sense of the scale of that, Lake Powell currently holds 11.2 million acre feet of water. 3.5 maf is a meaningful increase in storage. The Bureau of Reclamation’s monthly operations report, out today, projects Powell ending September with a surface elevation of 3,640 feet above sea level, 32 feet above the forecast just a month ago. There is no doubt there will be enough water in the upper basin this year to release bonus water downstream to the lower basin. The big question is will it actually happen? If the USBR implements the same strict ‘letter of the law’ approach they have adopted since 2008, there is a good chance the answer will be no. Their current study predicts Lake Mead’s lowest elevation during this water year to be within the bonus water trigger point by a mere third of an inch in elevation; and there are still two normally wet months to go. This could be a year where the lower basin states are punished for conserving water. The concept of punishing because of water conservation is nothing less than ludicrous! I hate to say it, but water managers in the lower basin states, might want to consider putting the Drought Contingency Plan progress on the shelf for the time being and, instead, draw (only) as much additional water as needed to keep Mead’s elevation under 1075 feet during this water year. Increasing the intended lower basin draw by a relatively small amount would mean an inflow increase of almost eight hundred thousand acre-feet. This is not inconsequential! With the bonus water Mead comes real close to meeting its downstream requirements; however, without it there will be a large deficit resulting in somewhere around an eight foot drop in elevation (which will also essentially guarantee the declaration of a shortage condition for next year). Oops, a minor correction to my post above. I meant a mere third of a foot (not inch). Or to be more precise, using their numbers, it’s 3.72 inches.